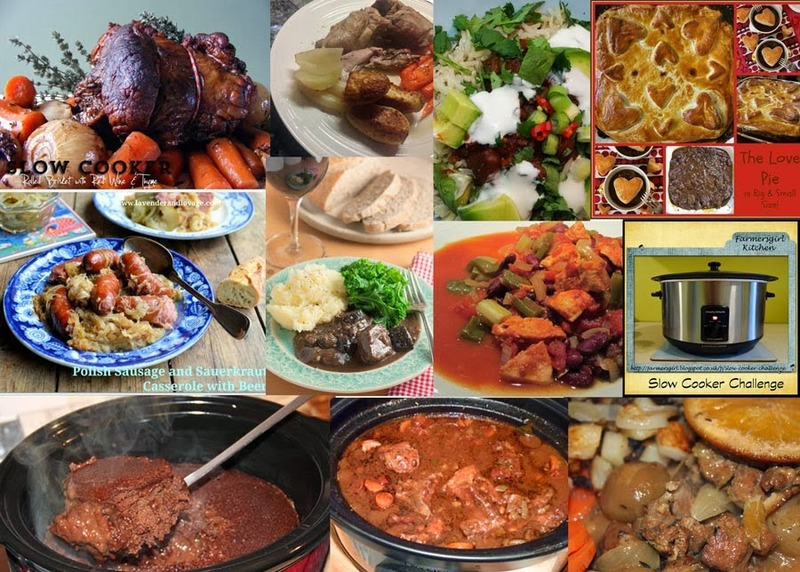 Thanks to everyone for all the lovely slow cooker recipes entered in this month's Slow Cooker Challenge. The theme was an open one, so any dish could be entered and we had a giveaway of The Southern Slow Cooker by Kendra Bailey, details of the winner at the end of this post! 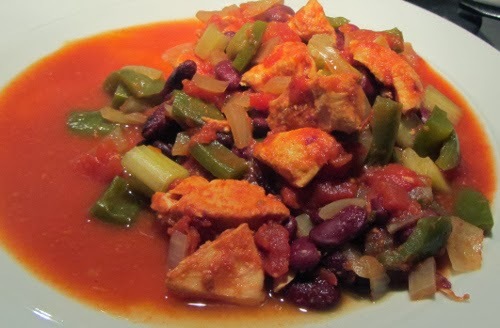 Corina at Searching for Spice created a Chicken Chilli in her Slow Cooker, it looks so full of colour and packed with veg, its got to be good for you. Old fashioned Slow Cooked Oxtail is the dish prepared by Deon at Food Jam. Deon ate this stew growing up in Africa and highly recommends it. It's years since I had ox tail and this has certainly put me in the mood for it again. 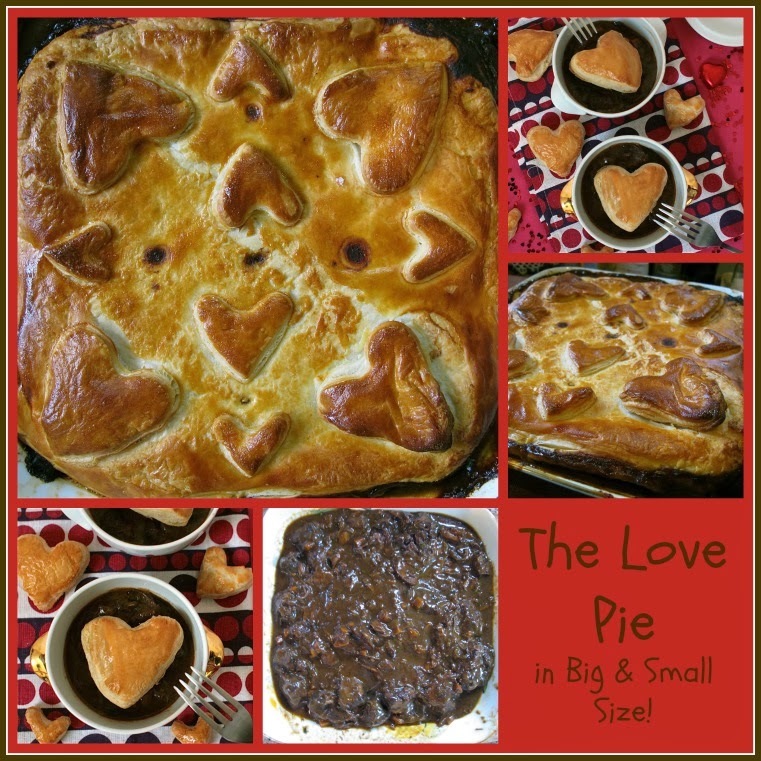 The Love Pie is a special treat made by Lou of Eat Your Veg for her family. The Slow braised shin of beef filling is slow cooked in red wine before being turned into this very special love-heart adorned pie. Now that is really special. This Slow Cooker Pork and Orange Casserole is an adaptation of a popular Pork, Leek and Apple casserole that Ness at Jibber Jabber has been making for some time. It certainly looks like a rich and satisfying recipe. I'm delighted to see a joint of meat amongst the entries. 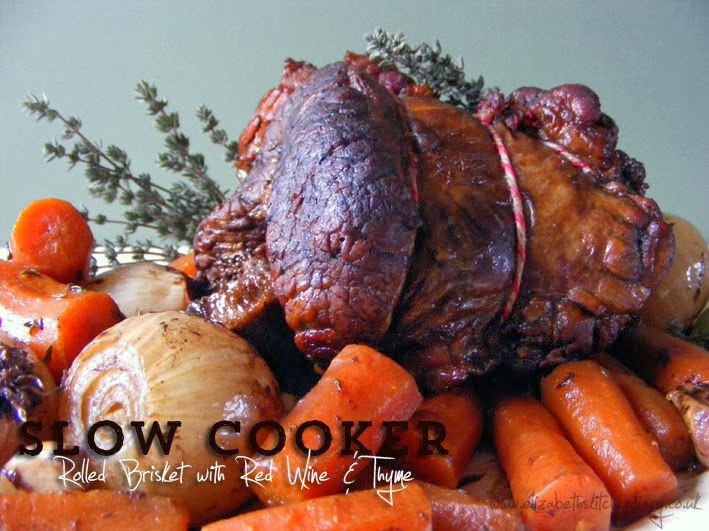 The slow cooker is perfect for the long slow cooking of joints like brisket and Elizabeth at Elizabeth's Kitchen Diary cooked her piece of Rolled Brisket with Red Wine and Thyme. 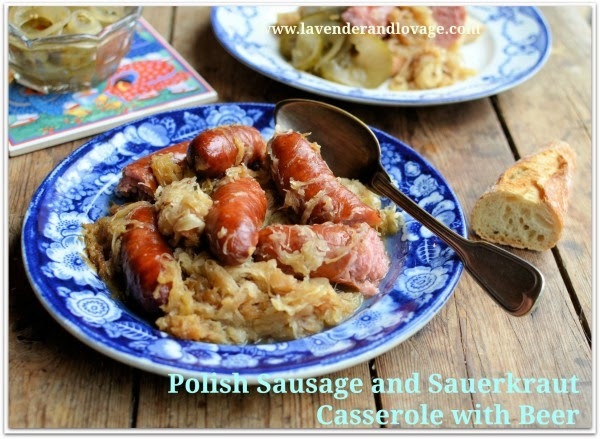 Karen at Lavender and Lovage has come up with a very European dish, Polish Sausage and Sauerkraut Casserole with Beer she serves it on the plate as above or as a sandwich in a baguette as a more informal meal. Claire at Good Egg Foodie was trying to recreate a Greek holiday dish of Slow Cooked Rabbit. It didn't quite meet her expectations but still made a substantial and tasty dinner. Keep trying Claire, sometimes with the slow cooker you have to take the stock out and reduce it on the stove to get that sticky sauce. And so to dessert! Sarah, of Tales from the Kitchen Shed, is a bit of an expert with the slow cooker and has even published her own e-book Pukka Slow Cooker Recipes. This gloriously sweet and sticky pudding is a Slow Cooker Molten Chocolate Mocha Pudding which comes with it's own pool of Tia Maria sauce, how delicious. It's so good to see some less common cuts of meat coming into their own through the slow cooking. 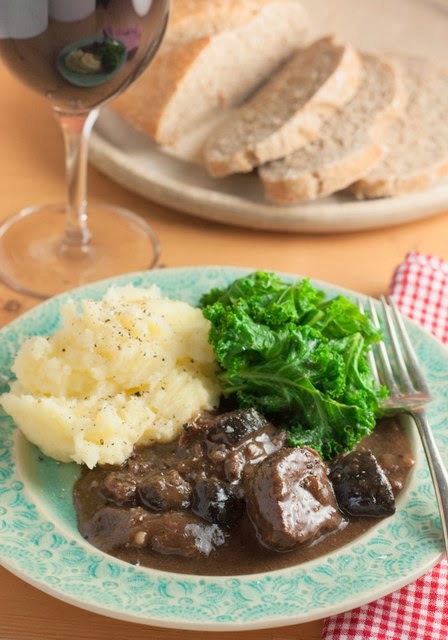 We've already had Oxtail and Shin of Beef, now Helen at Fuss Free Flavours bring us Slow Cooked Ox Cheeks with Red Wine and Pickled Walnuts. 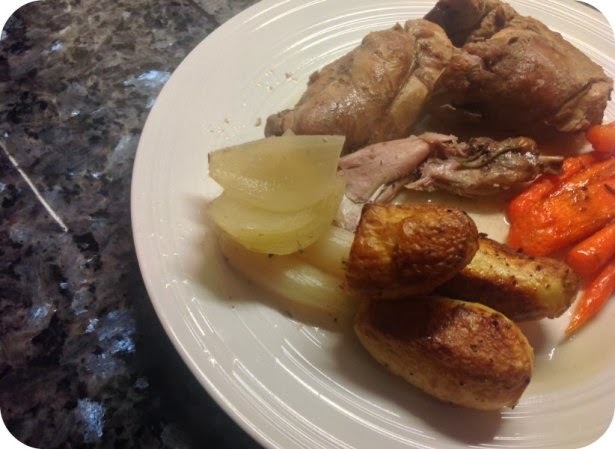 Helen gives us some great tips to get the best from your slow cooker meals, so be sure to pop over and check them out. I hope you have enjoyed this Slow Cooker Challenge Round Up, the March challenge will be posted on Monday 3rd March. And the winner of The Southern Slow Cooker by Kendra Bailey is #3 Lou at Eat Your Veg, Congratulations! Pudding the slow cooker? Who would have thought! How intriguing... must investigate further. :) A lovely round up Janice, and it was a pleasure to finally share a recipe for it! Thanks Elizabeth, I'm keen to try making pudding in my slow cooker too. Thanks Sylvia. A lot of the recipes could be adapted to cook in a low oven too. Yes you should! I am totally in love with mine now, you need to plan ahead a bit but I'm sure that is no problem to you. Fab round up. love the idea of pork and orange together. Lovely round up. I don't have a slow cooker as most veggie dishes are so quick to make. I'm glad there was one recipe I could properly look at ;-) Interesting concept though, making pudding in a slow cooker. Oh I'm glad it's making you use your slow cooker, Karen. Thanks Bintu, yes that sounds like a really nice combination of ingredients. Thanks for commenting anyway Nayna, much appreciated. oops sorry about that, should have posted a warning! The dessert is proving very popular! Yes, it's surprising but then when you think about it, it makes sense. You can even bake in your slow cooker, not tried it yet but I will! Fantastic round up. I really do need to invest in a slow cooker. Some great recipes here Janice. Not sure why I haven't entered your slow cooker challenge before, as I LOVE my slow cooker! 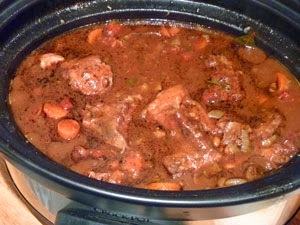 So chuffed I won with my first ever Slow Cooker recipe, whoop, whoop! Looking forward to lots more experimenting with my new acquisition, and lots more entries. LOVE the molten choc pud! You should look at the March challenge Fi, there's a really interesting technique for small portions. Thanks Tina, slow cookers are quite inexpensive now and really worth investing in. Ill let you off Jane, I only started it in January! I'm pleased that you are pleased Lou! Makes it worthwhile and I look forward to seeing more of your experiments. Thanks Camilla. It works a treat, I did a huge bit of brisket at the weekend and it cooked up a treat and so little effort. 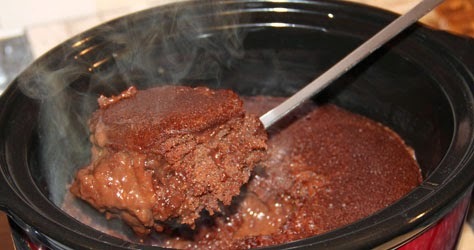 I love my slow cooker, and have also used it to steam puddings. Crockpots rock!